Hi Maria, watching your posts on Great Danes with interest. Been meaning to send these to you for ages. This is my dad’s Great Dane, Zimba, 1940, when he was in RAF in Palestine, with mum’s Boxer pup. Zimba was trained as a guard dog for them both, it was very dangerous there then, everybody was trying to kill them, the Boxer’s dam was an explosives sniffer. Mum was a nurse and bombs would be put in taxis going to the hospitals. Funnily enough, have noticed that Missy, my Boxer, has the most amazing sense of smell for finding hidden stuff ! Both breeds have certainly changed in the last 70+ years ! Hope you keeping well, Sandra. I don’t know how long Zimba lived, mum was sent to S. Africa in July 41 to have me and dad was sent to Burma and had to leave him behind. As he was an RAF dog another officer got him. Dad had an armoured car driving round the desert and Zimba was with him much of the time. Zimba didn’t like camels, and apparently made the AC quite uncomfortable at times. I did try at one time to get more information but no records kept after the English pulled out. Thank you, Sandra, for sharing your precious story. Zimba was indeed some working Dane! Much more recently I had read of a Dane that was working as a Search & Rescue dog in one of the Israeli canine units. Indeed many Great Danes have shown great ability in this type of work and there are several contemporary individuals who are doing this activity either as a sport or in service. I must do some digging, in case we can find out more. Maybe this latter Israeli dog goes back to Zimba? Sandra also sent me this picture, with the Boxer puppy all grown up, with her dad. I remember a letter in the Boxer Blätter magazine, from a Nordic country, lamenting the loss of ability for scent work by specimens with too short muzzles. Look at this sniffer dog above, doing real service, and wonder about the human stupidity, robbing breeds of their most valuable skills. Particularly in hot weather, a long nose and open nostrils – not the stenotic nares we see today unfortunately in brachycephalic breeds – are essential for fitness and function, as one of the very important functions is to cool the hot air coming through the nostrils, otherwise the blood vessels carrying the blood would cause overheating, first of all to the brain, and the dog would have to stop and cool down much, much earlier than a dog with a short muzzle. A lesson for all breeders, including our breed. This is a British Army Dane. 1922-1924. Look at this WWI Military Mascot Dane ! 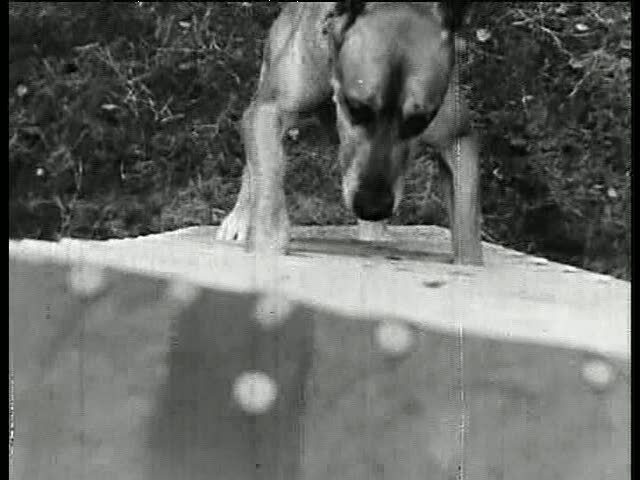 And in this 1943 video we see a Great Dane in a military facility in Norfolk, VA, United States. I have received a mystery photo and I have a request: this dog, possibly called “Duke” was a US Navy Mascot. If any reader knows more about him, please contact me. Photo supplied by Lisa Williams who visited the exhibit at the military museum in Sampson State Park, NY. Yes, Sandra, you’re definitely right. Danes & Boxers have certainly changed ! Sweety, above, was a conformation Champion & also a top Agility Dane in Finland.